I wasn't expecting to discover another secret to achieving happiness in the garden. I had already discovered a lucky thirteen of them over the course of time and figured that was it. I have committed the first five secrets to memory and can recite them as almost an "elevator speech". You all know what an elevator speech is, right? It's that little spiel you memorize and are prepared to go through when you have just a minute or so, or the length of time of a short elevator ride, to say it. Here's my spiel for the first five secrets to achieving happiness in your garden. "There are five main secrets for achieving happiness in your garden. Follow these and I promise you'll be a happy gardener. Grow the plants you love, size the garden for the resources you have, buy good tools, respect Mother Nature, and share your garden with others." When I say them, I find myself counting off the secrets on one hand. I'm still working on a spiel for the second five secrets, which include plan your garden, feed the soil, strive for balance, ask for help, and change your garden if you don't like it. Then there are three more secrets that really need two more to go with them to make them a set: try new plants, plant for the future, and take a break from your garden. Fortunately, I finally found that missing 14th secret. It was there all along, as most of the secrets to achieving happiness in your garden are. I just needed the right combination of warmth, sun, and time in the garden to find it. It was written in the very fine print on the back of an old plant label, one of those labels you find lying around the garden not anywhere near the plant it describes. Maybe a clever garden fairy left it there for me to find it. Regardless of how it came to be there, I picked it up and noticed that there in that fine print it said "Visit your garden, the 14th secret". Makes perfect sense. We often are out in our gardens - to weed, mow, mulch, hoe, plant, dig up, pull out, water, edge and do any number of other tasks. We rarely just go out to our gardens to visit them, to walk the paths, smell the flowers, leaving pruners, hoes, gloves, and other tools behind, lest they tempt us to start gardening before we've really had a chance to see and enjoy the whole garden. It's kind of sad in a way, to never visit your own garden. You may find it hard to visit your garden without wanting to reach down and pull a weed, or run back to the garden shed to get some pruners. Visit your garden, and learn the 14th secret to achieving happiness in your garden. What a timely secret...spring brings so many garden chores and the opportunity to try new things. Yet spring can be one of the most beautiful times in the garden. I think I will visit my garden soon! Oh, this is SO TRUE!! I have been working like crazy to get my garden ready for an upcoming tour. My neighbor was over visiting, and she asked me if I had taken some time to just enjoy my garden and appreciate it instead of just working in it. I need an objective perspective on my garden right now. I have moments of panic thinking that it is not good enough for the tour... because I am too close to it right now seeing every minute detail out of place. I think a "visitor" would see the overall beauty instead of every speck out of place. So I need to relax and "visit" my garden and enjoy it. And I will -- just as soon as the tour is over :-) Thank you for this wonderful reminder and secret! You hit the nail on the head for me!! That is truly a secret to happiness, Carol. We work so hard in our gardens, we must take time to enjoy them every moment we can. I look forward to number fifteen, to make it all even and everything. This is so true! I try to walk around my garden, just to enjoy it without bending over to pull a stray weed. Walk and listen to the orchestra. Great tip! It's hard to visit without wanting to do something. I often visit my garden from the inside though - when my little kids are testing my patience, I go to the spare room that overlooks part of the garden and look out the window. The view of the garden is so relaxing and is a little mental vacation! 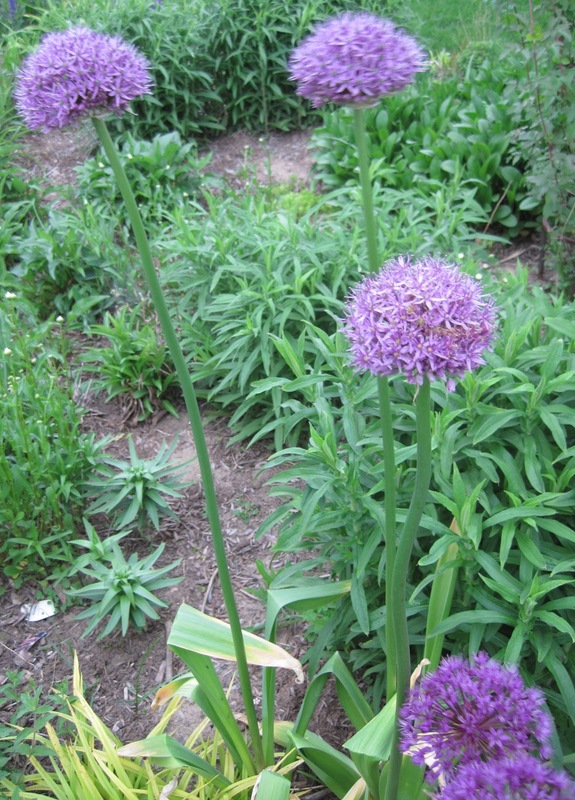 Love your allium flowers... 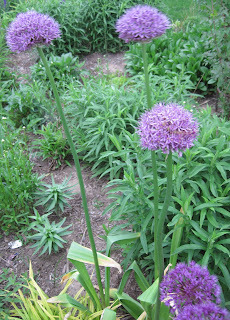 I'm attempting to visit my allium with my camera every day while it is in bloom. I have been forced to just visit my garden this spring. Being forced to do something can often make you realize that you actually like the task at hand. Free from the actual labor of gardening, which I do love,I am relishing the actual beauty. A good secret! I think that's the hardest secret yet. Many is the time I've gone out with a cup of coffee just to look at the garden, and many is the time I've found myself doing something I hadn't planned on while my coffee gets cold nearby. This is a tough one. I do try to stop and smell the flowers at least once a day, but to go outside without gloves, a tool or a camera in hand is challenging. Or maybe, when I'm out there with the camera, I am actually visiting? I had been pretty pleased to discover this page. I definitely enjoying every amount of it and that i maybe you’ve bookmarked to check out new stuff you post. Love all of your "secrets" - especially the new one! Don't know how you do this but your posts always make me feel like laughing and crying (in a poignant way) at once. Cool post! I really had a great time reading your post. Intellectually written indeed.